Statway has been shown to have a positive impact on students’ completion of college math credit. The ultimate goal of Statway, however, is to improve longer term outcomes of transfer and degree completion. The current study uses a quasi-experimental propensity score matched design to examine student outcomes – transfer from a two-year to a four-year institution and two-year and/or four-year degree attainment – among students at six community colleges that offered Statway in the 2011 and 2012 academic years. The results show that Statway students earned degrees and transferred in greater proportions compared to similar students who enrolled in other developmental math options. 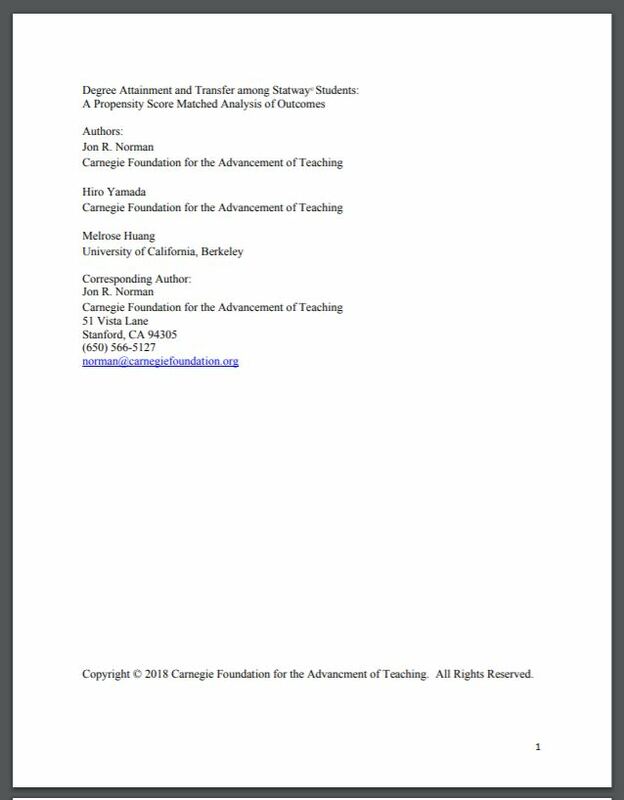 This analysis shows that, on average in the six schools for which data were available, enrollment in Statway increases the likelihood of transfer or degree completions and provides evidence of how an alternative to traditional developmental math can have a positive impact on students who often face strong headwinds completing educational goals. This report is currently under review at Community College Review Journal.